After the backlash on retired Cebu Archbishop Ricardo Cardinal Vidal when he read a statement calling for President Benigno Aquino III to resign, the prelate clarified through his secretary that what he read was the stand of the National Transformation Council (NTC) and not his. Cebu Archdiocesan media liaison officer Msgr. Joseph Tan, meanwhile, cautioned the group against misrepresenting church officials after they included Cebu Archbishop Palma in the list of bishops who support the call for the President to resign. The Commission on Audit (COA), meanwhile, has called the attention of the Cebu City Government about unimplemented, terminated and ongoing 2014 infrastructure projects worth millions. The statement calling on President Benigno Aquino III to step down that retired Cebu Archbishop Ricardo Cardinal Vidal read last Friday was not his personal stand but that of the National Transformation Council (NTC). That, according to Fr. 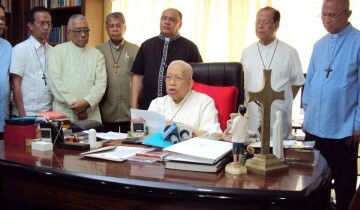 Jojo de Aquino, Cardinal Vidal’s personal secretary. De Aquino said Vidal showed him the NTC statement hours before he read it in a press conference in his house. De Aquino said he noticed it was calling for President Aquino’s resignation and raised this concern to Cardinal Vidal. He said Vidal immediately started making corrections on it. De Aquino said Cardinal Vidal’s reading of the statement was only meant to bring concerns raised by NTC to light. He said NTC members often come to his house to tell the archbishop of their concerns. De Aquino said it was only on the day after the press conference that that the cardinal realized the effect of his gesture. He said Vidal was saddened by how the message was interpreted. ABS-CBN report on the incident. Vidal thought NTC members and the bishops went to his house only for his post-birthday celebration, de Aquino said. Cebu Archdiocesan media liaison officer Msgr. Joseph Tan, meanwhile, urged the NTC to avoid misrepresenting Church officials after the group included Cebu Archbishop Jose Palma as one of five bishops who supported calls for Aquino to step down. Tan said Palma was surprised when he was listed among the bishops who supported calls for President Aquino’s resignation. Ninety-three infrastructure projects worth a total of P629.45 were supposed to be implemented in 2014. However, according to a three-page audit observation memorandum dated Jan. 27, only 48 out of 93 projects were implemented. These amounted to P228.66 million. Twenty-eight projects with a combined cost of P332.65 are still ongoing, with 17 of them beyond their targeted date of completion. COA asked the City Development Council to faithfully monitor and evaluate the implementation of the projects so that any cause of suspension or other related problems will be immediately addressed. It also asked the Cebu City Government to explain the cause of the delays and to fast-track implementation of its ongoing and suspended projects. Department of Engineering and Public Works Chief Atty. Jose Marie Poblete said the major reasons for the delay were road-right-of-way problems. According to the Land Transportation Franchising and Regulatory Board (LTFRB), the petition to reduce taxi fares remains pending amid movements in the prices of fuel. The taxi fare rollback petition was filed by Negros Oriental Representative Manuel Iway. Iway petitions for a P40 flag-down rate to be reduced to P30 and a further reduction of P1 or from P3.50 to P2.50 for each of the next succeeding 300 meters. Rates of petroleum products went up last week following a series of rollbacks in the past months. The Metro Cebu Taxi Operators earlier opposed the call to reduce taxi fare, pointing out that the prices of spare parts and accessories have remained the same. Instead of requiring establishments to remove parts of their structures that have encroached or are even built over the river in Colon Street, the Cebu City Government would now construct new water channels to address flooding in the area. Sun.Star Cebu: Mandaue police station chief relieved for not returning gun of former Bacolod congressman Anthony Golez Jr.